Reality struck as I attempted to get under way from a stop light and found that my Royal Enfield Bullet wouldn't shift into first gear. I made a clutch-defying second-gear start and limped home. I knew the left-shift mechanism, part of every four-speed Royal Enfield Bullet imported into the United States since 1995, had foiled me once again. The new five-speed Bullets, available since 2004, don't suffer this problem, having been built from the start to shift on the left, American style. But the four speeds are another matter. The complex bodge that turned an old British style right-shifter into a DOT approved left-shifter is subject to slop. There's plenty of slipping, sliding, twisting and pulling apart in the mechanism that transfers the shifting action across the bike. I've tightened it up and rebuilt it many times and thought it should work reasonably well at the moment except for one thing: the excess movement where the gearshift shaft emerges from a tube beneath the primary case. Here's the problem: I've looked this gearshift shaft over, top and bottom, trying to determine how to wiggle it out without having to pull the primary case off. Getting to it clearly means first removing the clutch, the alternator, and the inner primary case. All of that is fraught with not-for-beginners dangers. Left-shfit linkage (tinted red) as it looks with primary cases off. But then a light bulb went off. 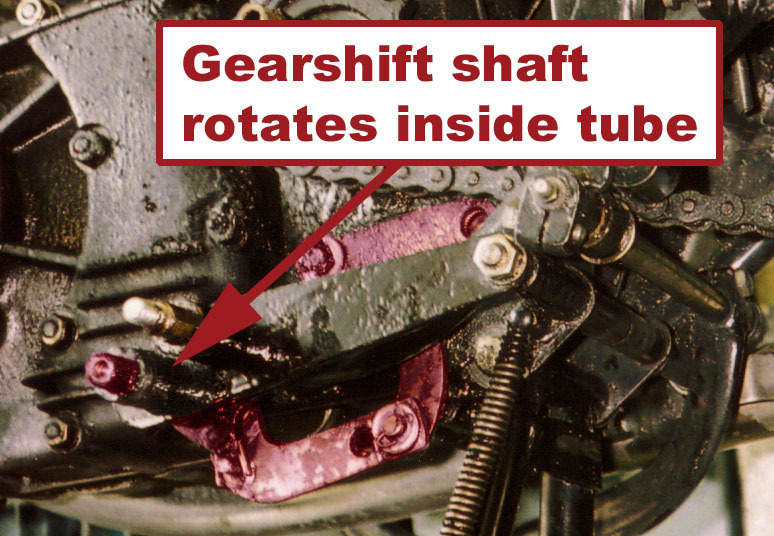 What if I simply removed the gearshift lever (one nut) exposing the shaft that runs inside the tube beneath the primary. I could then curl some sort of thin material and push the resulting sleeve into the tube along the shaft. Presto: the shaft would stop wiggling inside the tube and when I pressed on the attached gearshift lever I'd get first gear instead of loosey-goosey movement! At least, that is what I hoped would happen. I got right to it. The gearshift lever came off easily, exposing a washer held by a circlip. I don't have circlips pliers, but eventually I got it off with pliers. The shaft was now visible, inside its tube. These parts are supposed to operate without a sleeve, so I wasn't surprised that any material I used to fashion one was going to have to be very thin. I visualized cutting up an aluminum soda can. But here's a surprise: the aluminum used in modern soda cans is much thinner than I recalled. Thinner than paper. My homemade sleeve squeezed into the tube fairly easily. Too easily, it turned out. With the assembly back together I found the shifting improved (I could get first gear) but far from perfect. Thicker material for the sleeve might have been better. I'm going to closely examine the next can of Guinness I open. Maybe it's made of thicker metal. But here's the thing. I emerge from each bout with the left-shift gizmo convinced that I ought to just Bite The Bullet and buy the kit sold to convert my motorcycle back to the right-side shifting intended by Albion when it designed the gearbox. This article is the First Part in my efforts to improve the bodge. Part 2: Improving the linkage bushings. If you are totally enamored with that bike then I would get the right side conversion kit. That mickey-mouse crossover linkage was designed to get the bike compliant for import into the US, nothing more. In 1976, Triumph Meriden's Bonneville came with left foot gear change that was from a completely redesigned gearbox. It was an expensive but correct move. My Bonnie was the best shifting bike ever; always positive and right on. Did the right side conversion on my 2000 bullet. absolutely best mod ever lost ten pounds of scrap metal and it shifts and brakes like it should. well worth learning the new controls. One time expense but more reliable and an extra gear to play with.